DSC Mission: To draw out the echoing twang, reverb, and darkness from the smoldering remnants of manifest destiny, still mournfully beating in the hearts of our unknowing constituency. 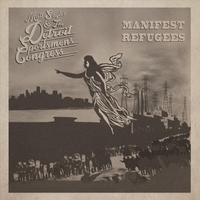 The Detroit Sportsmen's Congress is a non-democratically elected representative delegation of roots-music musicians founded in 2015 by current House Speaker, Matthew Sayles, and former Majority Whip, Ralph Lowi. Though qualifications for membership in this self-described "august body" are deliberately byzantine and obscure, it is rumored that casual fandom of Detroit athletic associations and support for alternative forms of country music are desired, but not required, for representative status. Prior status as a trapper or "puller" of clay-pigeons is also taken into consideration as a qualifying factor for non-elected representation. Sayles & Lowi first conceived of the DSC shortly after their brief membership in "the Mutineers," and upon further deliberation in the remote sequestration of their neurological recesses , set forth, and assembled the first Congressional session of Detroit Sportsmen in November of 2015. Membership of the DSC is deliberately flexible as representation can grow and decrease based on periodic census gathering and caucusing. However, core foundational doctrine (drafted and signed into bylaws by Sayles and Lowi) maintains an undeniable emphasis on original songwriting. "The Detroit Sportsmen's Congress was founded on the principle that existing genres of folk-rock, country, and Americana are meant to be crafted and sculpted into new forms of auditory ambulation--and that complacency carries consequences." "To draw out the echoing twang, reverb, and darkness from the smoldering remnants of manifest destiny, still mournfully beating in the hearts of our unknowing constituency." Members have performed in bluegrass, western swing, klezmer, cajun, zydeco, punk, country, and rock bands--and have shared the stage with musical legends like Merle Haggard and Dwight Yoakam--as well as other more obscure geniuses that weave through the fabric of a frayed --but passionate-- underground west-coast country and roots music scene. DSC House Majority Leader Matt Sayles is the songwriter of the DSC and founding member of Marquette, Michigan's "Frostbitten Grass" and Ventura California's, "Ventucky String Band." This is Sayles' first departure from string-band music since touring with progressive Texas blues guitarist, Francisco Mirabent in 2006 --and his first project with a full rhythm section. Former Majority Whip, Ralph Lowi (retired), is a brilliant multi-instrumental artist and founder of Santa Barbara's "Holdfast Rifle Company." Rep. Lowi is an excellent guitar player, bassist, vocalist, and electronic artist with an encyclopedic knowledge of music history across multiple genres. The Honorable Dr. Jay Carlander is a renowned central coast guitarist, with a multitude of styles and influences, and is the most recently non-elected member of the DSC. Terry Luna is a founding member of "The Depths," and a former member of Santa Barbara's "Mutineers." His bass playing is renowned, as are his skills as a jeweler. The Honorable Bill Flores (Jeff Bridges and the Abiders, Whiskey Chimp, The Pontiax) plays pedal steel, baritone guitar, and lap steel guitar in the band, and is one of the most sought after multi-instrumentalists on the West Coast. The Honorable Ben Saunders (Hold Fast Rifle Company) is the most recently elected member, and brings his years of jazz training to the Congress with excellent keyboard and accordion work. Drummers in the DSC have included Mike Beers, Austin Beede (Alastair Greene Band, Alberta Cross), and Blair Harper (Hold Fast Rifle Company).